Our archive is under development, but here is an article that started it all for the owner of Manhattan Rickshaw Company. Back in 1992, the pedicab operators in San Francisco were coming under some pressure by a few merchants in Fisherman's Wharf, an area popular for tourists and for all things, shall we say, "touristic." The pedicab owners thought they deserved a place to wait for passengers, and eventually the city agreed, and gave them space. A victory. Nice. This is not unlike the current challenge facing the New York City pedicab industry, which is now facing new city government regulation in the form of Regulation 331-A (see www.nycpoa.org for further information or click on the NYCPOA logo on our home page). Regulation 331-A limits the number of pedicabs that will be allowed on city streets to just 325. That's 325 for the entire city. Yes, we lobbied the city council members tirelessly. We learned we had a few friends in Council, but we had overwhelming odds. We are facing an uncertain future. 331-A sets forth operating rules (which we otherwise agree with), except for the rule denying us the right to use bike lanes (! ), ride a pedicab empty across a New York City bridge (hey: we pay taxes, too! 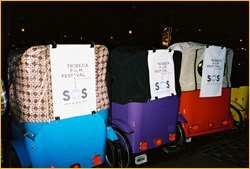 ), as well as stifling pedal-vehicle development by banning electric assist pedicabs. Electric-assist bicycles are all the rage in Europe, you might not know. Even respected U.S. brand Schwinn is making electric-assist cruiser bikes! And a federal law states that any electric assist with a motor output of one horsepower or less is to be classified as a bicycle.